The Boots Nike's players - Cristiano Ronaldo, Landon Donovan, Wayne Rooney - will wear at South Africa for the biggest sporting event in history! The time is now to change the course of history. The Mercurial Vapor Superfly II FG WC is equipped with a carbon fiber outsole plate for greater speed when attacking the defense. Upper Features: The Superfly II has an ultra-thin Teijin upper that's lined with Flywire filaments in a soccer-specific cabling pattern to deliver a precise fit and optimal support. Asymmetrical lacing enlarges the contact zone. INSOLE: The Superfly II has a contoured sockliner with a Superfly EVA insole. Sole Features: Carbon fiber composite plate is the lightest and strongest outsole Nike has to offer. It has a pressure-activated adaptive traction system for speed in all conditions. The difference between a soft and firm ground stud is 3mm. 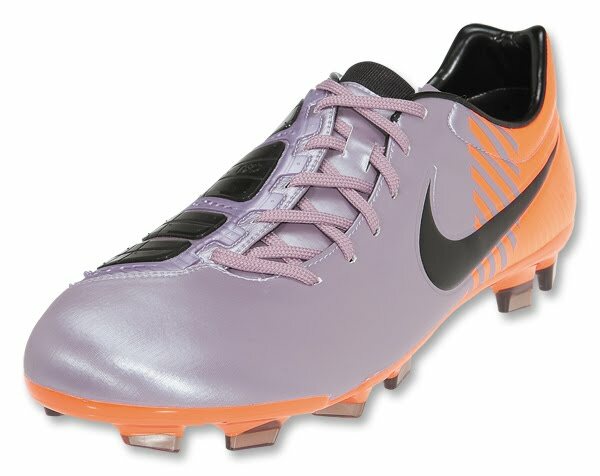 So Nike has developed a new stud that extends 3 mm when ground is soft for increased toe-off acceleration and traction. 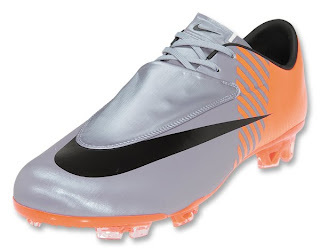 These two longer studs in the forefoot also prevent slippage and create the most comfortable feeling Mercurial ever. These new toe-off traction spikes enable extra speed bursts, just like traditional track spikes. Traction pad ensures grip no matter which way you move. Weigh 7.8 ounces. Upper Features: Ultrathin Teijin, which is lightweight and durable. Innovative instep pods ensure even pressure on the ball at impact for accuracy on power shots. Raised swerve fins create friction on instep strikes to increase rate of ball spin. INSOLE: EVA foam for heel comfort. Upper Features: Dawoo Synthetic lace cover creates a large, inviting strike zone. Teijin synthetic microfiber adjusts to the shape of the foot. INSOLE: The Vapor VI has a contoured sockliner with a Vapor EVA insole. Sole Features: Glass fiber composite plate is the lightweight and exceptionally strong. 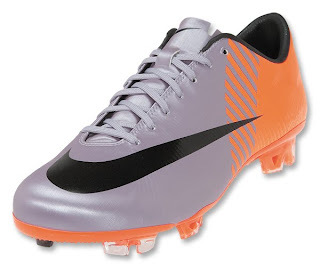 Dual density injected studs and a new Vapor Traction pattern allows effortless cutting and instant acceleration. Weighs 7.6 ounces. Each pair of Nike World Cup boots come with a unique user-code that allows online access to Nike Soccer+, where you will find accuracy training drills and expert tuition provided by the coaching team at Juventus FC. The Nike Soccer+ digital experience also has a coaching session from Fernando Torres of Liverpool FC. As an added bonus: Boots come in a special Elite package and with a ventilated boot bag.